A socially responsible cooperative business whose members provide child care services. We believe that every child deserves to be loved, that’s why we care for each one with the utmost respect. We also believe that children need more than just supervision, so we are trained to educate and engage them in ways that nurture and stimulate their development. 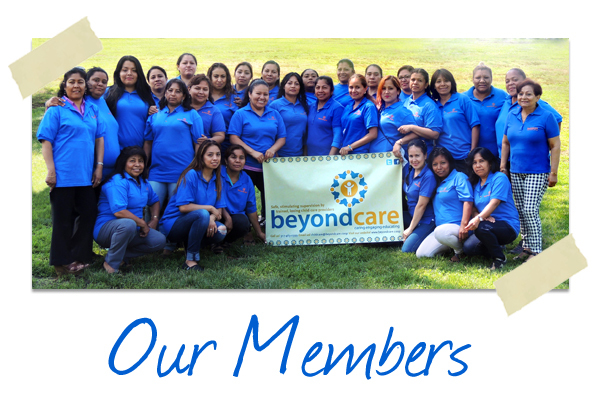 Beyond Care was founded on the basis of democracy, equality and justice. We promote living wage jobs in a safe and healthy working environment, while promoting personal growth and educational opportunities for its members. Functions as a backup/ emergency/ occasional/ date-night type of childcare service with a minimum of 4 consecutive hrs/day. If there is a need for specially scheduled care, M-F, Sat, and Sun, we are at your service. “I’ve used them several times and the sitters are excellent. Every sitter I've had was experienced and comfortable watching three kids. I've found them very reliable and prefer them to other services”. Beyond Care made it easy to find someone trustworthy to watch children during our meetings, and they found them fast. I have worked with two women from the cooperative, and both have been punctual and professional. My husband and I can go to work with peace of mind, knowing that our children are lovingly cared for by our wonderful Beyond Care nanny. We are impressed by the Beyond Care cooperative and grateful to have found such a caring, thoughtful and trustworthy caregiver for our children. Our nanny is really sweet and energetic with the baby. Plus, their cooperative is a wonderful worker model with good member participation.